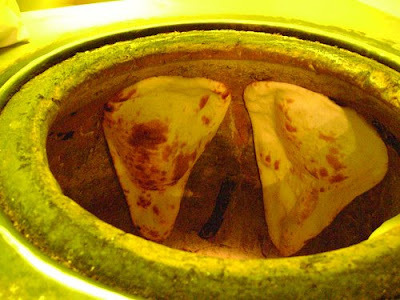 i just enjoyed a decadent lunch buffet at haweli restaurant. it's cheap, it's all you can eat, and the naan is something to cheer about. p.s. - go comment and vote on a "pink slip"
you’re so fine you blow my mind. so better than rice pudding. poll: barry makes the most of a bad situation. the other day one of my buds was talking about a new phenomenon in north america: pink slip parties. bars across the country are hosting recently laid off workers (who wear pink ribbons), their supporters (who wear blue ribbons) and recruiters (who wear green ribbons) as they network with one another over a cocktail or two. definitely a fun way to start job hunting, although when i first heard the term “pink slip party” i thought it meant that you could bring your pink slips to the bar on wednesday nights and get a free drink…even more fun, i’d say. during the 1930s it wasn’t uncommon to head on down to the bar to enjoy a cheap beer, sidecar or whiskey sour, and forget about your troubles…for a few hours at least. 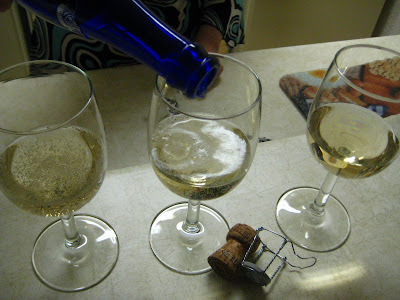 so here we are: in the midst of a world-wide recession, job hunting over a drink, or in some cases, under a few drinks. but why drink just any drink? i think that there should be a signature concoction for us to commiserate over our little recession, and i think we’re the people to get the ball rolling. i need your help to pick a new cocktail for the year. 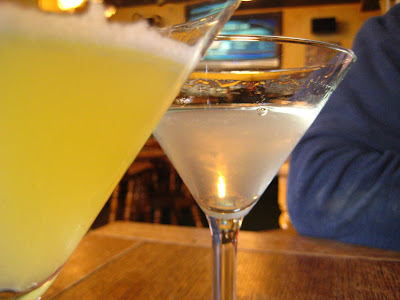 below are three possible recipes for a “pink slip”: a recession era drink that you can order when you go out and forget about the worries of the world for a few hours. i want you to vote on the poll (to your right) for your favourite drink of the three, and then comment why. whichever drink has the most votes by march 20 wins, and a new drink is born. after that, i want you to go out to your favourite bar and start ordering “pink slips”. you might need to bring the recipe along for the first few times, but after that the pink slip should start being a part of your bartender’s vocabulary. shake over ice and garnish with a hershey’s kiss. the campari represents the bitterness of the “pink slip” while the pineapple and lime juice represent the cayman islands, where you wish you hid all of your money. shake brandy and schlager over ice and pour into champagne flute. 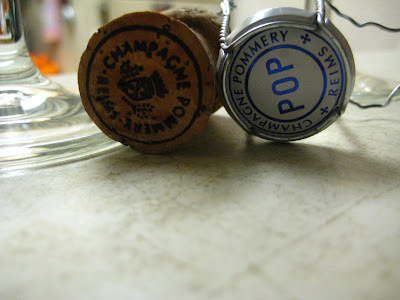 top with champagne and garnish with a cinnamon heart. okay, so it's not a frugal, recession-friendly drink, but it'll keep you warm now that your partner left you cold and alone for someone with money and a job. the gold flecks in the schlager remind me of a shattered man swallowing the last of his wealth before the bank can come and take it. hey, at least they're not diamond cufflinks in a balloon - right carlton? shake well over ice, and garnish with a cherry or starfruit. meh - it's sweet, has alcohol and it's pink. barry's restaurant review: river cree's kitchen buffet and bistro. friends, romans, seafood lovers, lend me your claw crackers. well, not really; those are provided for you at the river cree casino’s kitchen buffet and bistro for their friday night seafood buffet. this past friday, like every friday night, my little crustacean friends were brought in for the masses to consume. don’t worry about them – they’re not alone as salmon, shrimp, clams and mussels join them in their underwater dance to my plate, and they were also joined by some of their poultry and bovine friends. the feast included a salad bar, peel and eat shrimp, smoked trout, clams (which one of our party commented, “tasted like the sea”), mussels marinara, paella, cheesy mashed potatoes, salmon, ginger chicken, a panache of vegetables, pasta pomodoro, clam chowder, and, of course, crab legs with little pots of butter to dip them in. 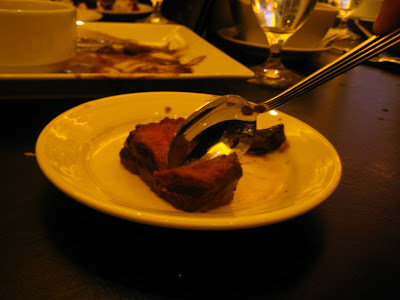 this was slowly followed by a dreamy dessert bar of fresh fruit, hot fruit cobbler and various delectable cakes like tiramisu, black forest, and a deadly bitter chocolate mousse that was so rich, you could only eat a quarter of it before you started to sweat cocoa. i know, but there’s more. one of our group decided that seafood wasn’t for them, so instead ordered a steak. a juicy and succulent steak prepared by the bistro’s sous chef don, who graciously came out later on to see how we were doing. don’s steak soon became legendary at our table. 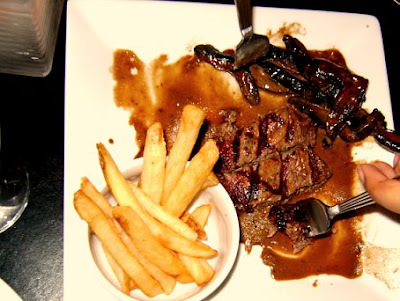 it was created with a delicious sauce of cognac and portobello mushrooms, and accompanied with some deceivingly simple fries. they were the best fries i’ve had in a long, long time, and the steak was so tender that it seemingly melted in your mouth. this was a true masterpiece, and i highly recommend that you try it to see if it lives up to your expectations of good steak in the middle of beef country. trust me, it will. but back to the main event. you might not think this would be a good place to meet new people, and yes, i was nervous to meet three new faces in the group when i knew i’d probably have food stuck in my hair, but how could you not bond over such a fantastic meal?! so what if crab shells were flying across the table as i hacked away with my claw cracker to get to the sweet crab meat? and so what if a shrimp tail accidently hit the stratosphere as i peeled my way to its juicy body, or that melted butter was dripping off my chin? we swooned over the clams, shrimp and crab legs. 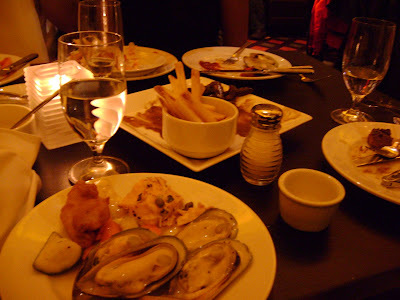 we cried over the empty mussels marinara pan that was always picked over right before we got there in the buffet line, and we sighed over the not-so-great clam chowder or salmon because we had such high expectations from the rest of the dishes. 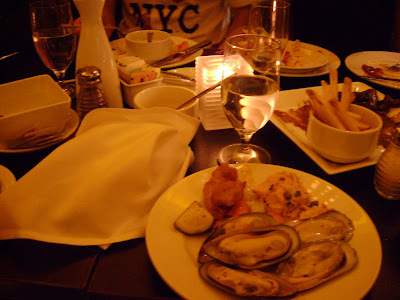 the seafood buffet was a great leveler as we all got messier and messier in our quest for good seafood, and we all had to laugh at ourselves at the disasters that we left in. i now have three new foodies to discuss the ins and outs of world cuisine with. just don’t forget to order finger dipping bowls before you start – it helps to shake hands with clean fingers. • only $19.95 per person! i know!! and if you’re a senior, you get an even better price. • the crab legs were incredibly sweet. • the shrimp and clams were incredibly fresh. • three words: steak and fries. • children are welcome (just don’t take them through the casino). • they don’t take reservations. we got there after 8 pm, and were warned that it could be up to a 2 hour wait. luckily, it was only 45 minutes. • the chicken was okay, but really, that’s not why we’re there. • we missed out on the mussels because too many people liked them. go home mussel eaters and leave some for us! • the salmon was overcooked. barry’s done with the pink!...well, after this post anyways. last time you’ll hear from me this week…promise. today i’m posting two more recipes in the note of pink: an easy but super fun entrée and a really inexpensive way to tjuzs up chocolate cake mix. 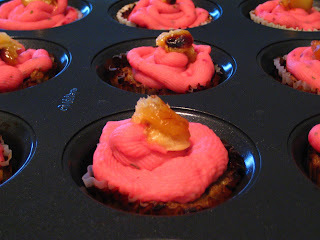 the first recipe was made for a potato-themed food fest this past summer; from the surreal gourmet, they’re meatloaf cupcakes with pink “frosting”. they were a big hit with my friends who are kids at heart, and with my niece and nephew, who are just plain kids. this recipe is really easy, and great if you want to make an activity of it: have your guest(s) frost their own cupcake. 1 cup indian fennel candies (the kind you get in a bowl as you exit indian restaurants) (i don’t like these so instead i roasted a head of garlic and used the cloves as the “cherries” on top. 1. place bread in a bowl. add 2 cups milk and toss with bread. reserve. 2. in a sauté pan over medium high heat, add 2 tablespoons oil and sauté onions for approximately 4 minutes, or until they become translucent. reserve. 3. in a large bowl, use your hands to mix chuck, eggs, thyme, parsley, salt, pepper, nutmeg, soaked bread, onions and ketchup. 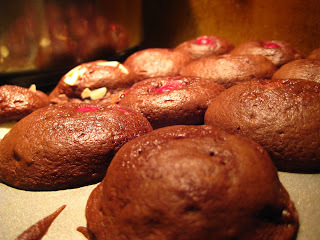 4. set oil-sprayed cupcake liners in a muffin and fill with meatloaf mixture. smooth tops so that they are flat. bake for 3/4 hours, or until fully cooked. reserve. 5. boil potatoes in a large pot of water until tender to the touch of a fork. drain water and mash with butter and half and half. mash until smooth. divide mashed potatoes into 2 separate bowls. add 1 tablespoon grated beet to one batch and all the parsley to the other. blend until you have a batch of pink and a batch of green potatoes. cover and reserve. 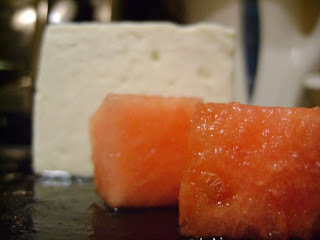 6. when meatloaf is done, "ice" half with pink and half with green mashed potatoes. sprinkle with indian fennel candies and serve immediately. since you're using beets anyways, you might want to consider using them as a side dish too. continuing on the cupcake theme, a bud of mine had the fantastic idea of making cupcakes by taking a chocolate cake mix and adding frozen cranberries to it, along with chunks of callebaut milk chocolate that they picked up from the bulk section at superstore. at first i was against the cranberries going in thinking that they would be too tart, but they were a fantastic balance with the chocolate chunks and helped moisten the cake. my friend topped each cupcake with peppermint flavoured green icing – instead, try using almond extract and red food colouring to store bought cream cheese icing for a valentine’s feel. barry has even more reddish recipes. so, as it’s a special occasion, two or three courses are just not going to cut it. sorry, but your facebook relationship status is on the line here. drastic measures must be taken in the form of a primi course before the main event. sure, these recipes COULD be used as the main event, but why would you do that? this way, you get more food. yay! okay now, we once again have two recipes from last food fest (we really outdid ourselves cleaning out our freezers), so hopefully you’ll also have some of these ingredients on hand (read: on hand = cheaper). the first recipe is from my cookaphobic friend who really can cook, even if she doesn’t know it. yet. 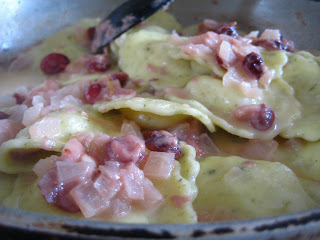 the second is something i whipped up to get rid of a package of frozen olivieri brie cheese and roasted garlic ravioli that was taking up valuable space in my freezer. the pasta is creamy but too mellow, so you need some punch in the sauce. barry’s bud’s cornbread topped with mexican goodness. my bud added grated aged cheddar & frozen corn - maybe a 1/4 cup of each. 1. combine cornmeal and milk. let stand 10 minutes. 2. combine flour, sugar, baking powder and salt in large bowl. 3. add egg and oil to cornmeal mixture. (my bud accidentally added this to the flour mixture). mix well. 5. fill greased muffin pans 2/3 full. (she did not use a muffin tin, nor did she grease the pan). makes 12 muffins (or the equivalent in non-muffin shape). okay, step 1 is complete. by the way, you can do this all the day before. now my bud made homemade salsa (diced tomato, finely chopped red onion, minced garlic, 1 jalapeno and fresh lemon juice) and guacamole (mashed avocado, a little garlic and lemon juice). if you make these ahead of time, the flavours will blend very nicely. let cornbread cool for an hour. heat up pan on stove and put a glob of butter on it. 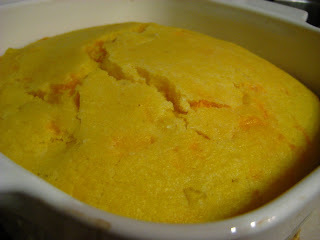 pan-fry each side of the cornbread until it's nicely browned and a tiny bit crusty (make sure to get the edges too). top with guacamole, salsa, sour cream and some grated jalapeno havarti. serve with enrique playing in the background. 1. prepare pasta according to package directions. 2. sauté onion in butter. 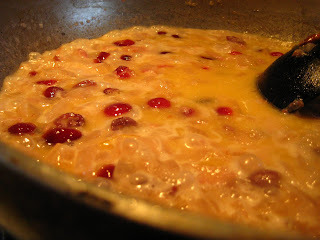 add cranberries, craisins, and half of lemon zest. 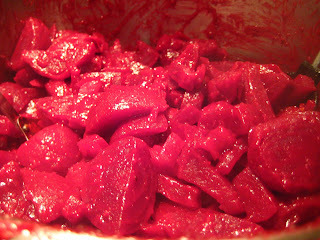 sauté until craisins start to plump up. 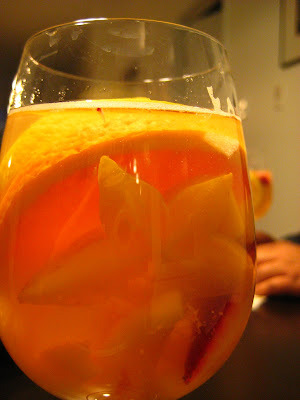 3. add wine and juice of half a lemon, reduce a little bit. 4. add cream and cheese. stir. 5. add nutmeg and remaining lemon zest. 6. toss cooked pasta with sauce and serve immediately. barry hops on the band wagon and thinks pink. i feel like a lemming right now. with v-day fast approaching, and everyone dreaming in reddish tones, i’ve decided to do the same and follow the masses over the cliff into a sea of pink froth. ugh. no, i’m normally not the kind of person who enjoys pink in any form, but in anticipation of the season i thought i’d help out anyone planning a menu for the weekend in the theme of red and pink. throughout the week i’ll be posting recipes that incorporate these colours in some form – all of them are easy to make, delicious, and inexpensive. 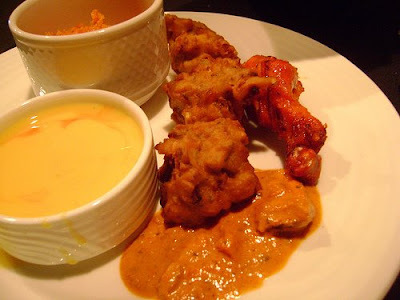 today i’ll start off with a few appetizers from our latest food fest. 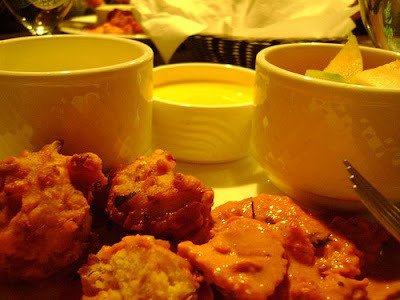 they’re great starters for a party or an intimate get-together…just as long as you like leftovers. 2. in a bowl, combine vinegar, oil and basil. 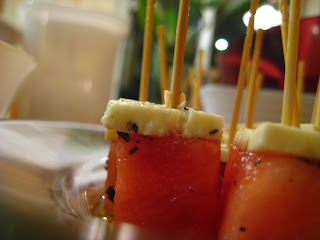 3. drizzle dressing on watermelon; serve. 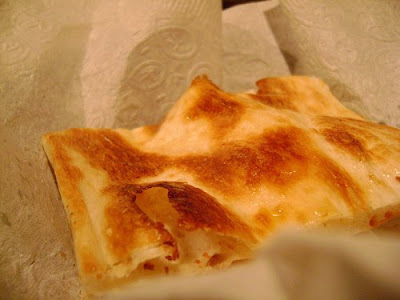 one of my all-time favourite recipes. combine 8 oz. softened cream cheese, ½ cup sour cream and ¼ cup mayonnaise. mix until smooth. spread cream cheese mixture in a platter. sprinkle on a couple cans of drained cocktail shrimp. 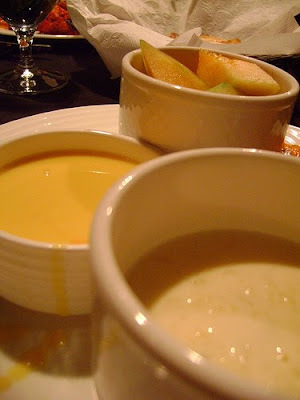 top with 250 ml (1 cup) cocktail sauce. 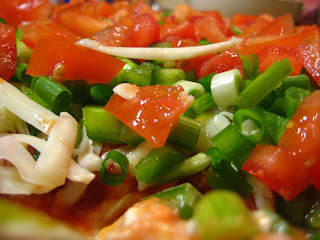 shred 2 cups of mozzarella cheese; sprinkle on top then add 3 sliced green onions, 1 diced tomato and 2 diced green peppers. barry’s bud seeks unattached ham man. and now we bring you the another installment of "barry's buds" – a guest column of barry’s many comrades who share a love of all things food-related. in anticipation of valentine’s day one of barry’s buds discusses her search for love that’s spanned continents, years, and many a kinder egg. it’s been four long years of searching. i’m seeking a man, age 4, with a black moustache and a penchant for ham legs (both for eating and clubbing people with). he might be violent, but he is one of the three musketeers after all. no, i’m not crazy, i’m just trying to hunt down the most elusive of kinder egg toys: i call him ham man. my search began in late january 2005, in a quaint italian town in southern tuscany. i wanted to see if there was a difference between chocolate in europe and chocolate in canada, and on my student abroad budget, a kinder egg was the perfect (read: cheapest) way to test this. as soon as i opened my kinder egg toy however, the chocolate became inconsequential. 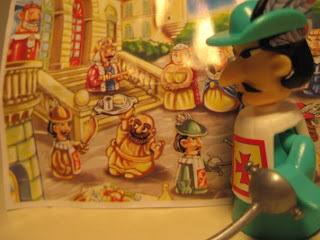 i ended up with a toy musketeer on wheels wielding a sword – a great find to be sure, but it was the musketeer collection insert that really caught my eye; it was the first time i saw *him*, or at least an artistic rendering of him. scene: anywhere. it could be timbuktu for all i care. me: oh, a kinder egg how nice. me: oh. it isn’t….is it…? me: OH MY GOD IT’S HAM MAN! …oh, what’s this? oh, a ring. thanks. HAM MAN!!!!!! you really love me!! me: …is it ham man? …is it ham man?! hapless suitor (grinning): just open it. me: oh. it’s a ring. um…nice. thanks. hapless suitor: well, do you have anything you want to say? me: yeah, where’s ham man? me: yeah, yeah, yeah. grandmother. heirloom. got it. me: ummm, so, seriously. there’s no ham man? barry’s back on a soup kick. hello all. after being away for a couple weeks, i’m back … i missed you guys. i realize that i’m being sentimental – soup makes me feel that way. yes, i’m back on the soup kick with a new flavour i tried on the weekend. 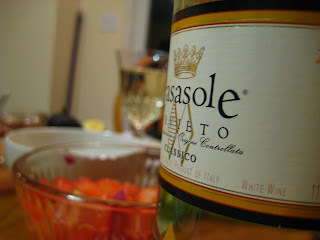 my buds and i have been having food fests whenever we can: food-themed evenings where we all cook dishes for each other. it’s cheaper than eating out, and you’re always guaranteed leftovers: win-win. this past weekend’s food fest was “clean-out-your-freezer-and-pantry-and-randomly-make-something”. 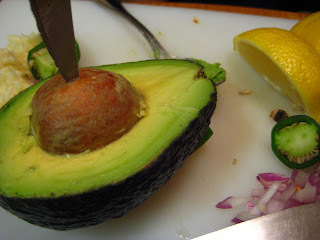 tons of fun with that hint of danger: you never know if what you make will be completely edible. luckily for my buds and i, we all survived and didn’t have a single bad dish. one bud found a recipe for a carrot soup that they changed and made their own. it was a big hit, so i thought i’d share it with you all, with the changes my friend made. enjoy hunting around your pantries, potato bins and freezers for the ingredients to this delicious concoction. 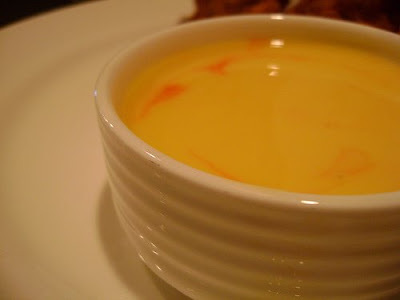 1. heat butter in a pot. add the onion and garlic. saute 3 minutes. 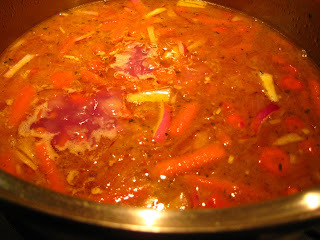 2. add the carrots and tomatoes. saute 5 minutes. 3. add stock, salt and pepper, nutmeg and ginger. bring to a boil. reduce. simmer 10 minutes. 4. puree. return to pot. 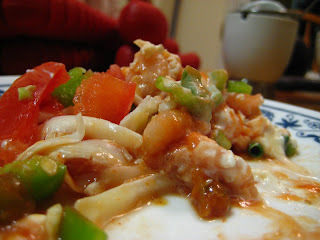 5. add the milk and sour cream. heat through, but DO NOT BOIL.